Qatar Airways has announced ‘Global Travel Boutique’ promotion, offering passengers from around the world amazing fares on flights in both Economy and Business Class. Valid from 12 to 19 September, the promotion will offer discounts of up to 40 per cent on fares in both Economy and Business Class, as well as special companion fares and discounted group bookings. Passengers can now book flights to the most popular global travel destinations, with Economy Class fares starting at $539 to (Mumbai), $679 to (Guangzhou), $669 to (Beijing), and $809 to (London)). Business Class return fares are starting at $1,359 to (Guangzhou), $ 2,059 to (Bangkok) and $ 2,099 to (London). These exclusive offers are valid for travel between 15 September and 31 May 2018. 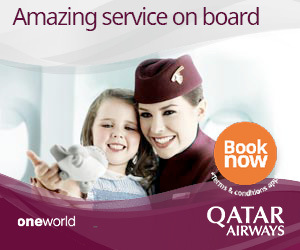 To take advantage of this offer, passengers can visit qatarairways website or any Qatar Airways sales office or contact your nearest travel agent.